Miller State Park in New Hampshire is one of my favourites to visit. Not only because it's close to home so we can just pop up there, take a hike and have lunch on the top of a mountain, but it's also just a nice little park. It sits on the Wapack Trail which runs from Ashburnham MA to Greenfield NH and you can park at the bottom of the mountain, take the Wapack up, and then a side trail back down. Total hike a little over two miles and with lunch (or perhaps just a snack) at the top it takes about three hours. It's a great way to spend some quality time with the family. Like most state parks though, there are signs that it suffers from the budget shortfalls that many of the parks in the state are suffering. I have yet to see the guard post staffed at the bottom of the summit road (although, having a season pass this isn't a worry for me) and then there are the little maintenance issues. The collapse of the entry sign being just the latest. 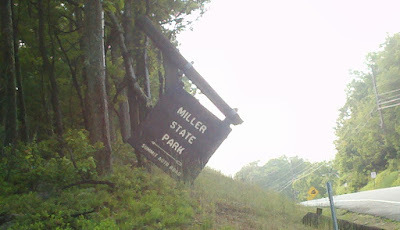 I hope Miller State Park can survive the budget challenges. It really is one of the gems of the NH Parks system.